New Jewish Agenda (NJA) was a national, multi-issue membership organization active between 1980 and 1992 and made up of about 45 local chapters. NJA’s slogan was “a Jewish voice among progressives and a progressive voice among Jews.” In this site, I interpret NJA’s demonstrated commitment to participatory (grassroots) democracy and civil rights for all people, especially including those marginalized within the mainstream Jewish community, as demonstrations of their definition of “progressive.” NJA was most controversial for its stances on the rights of Palestinians and Lesbian and Gay Jews, but their values of inclusion can be seen in their organizational structure as well as their varied choices of political campaigns. 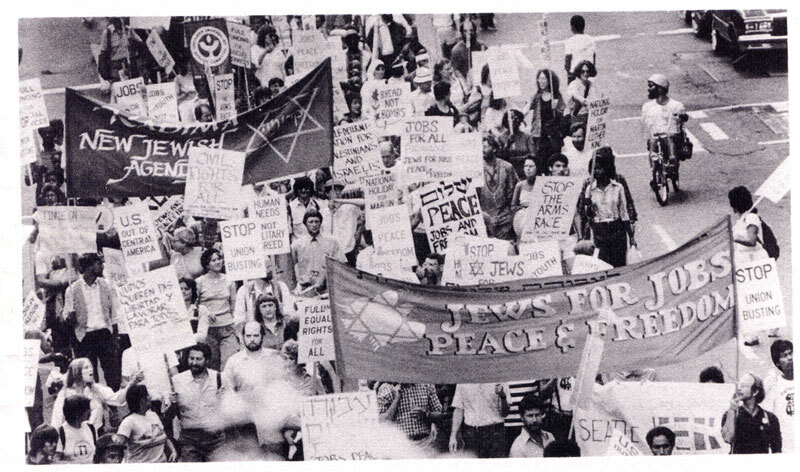 New Jewish Agenda (sometimes called “Agenda”) maintained five primary campaigns through National Taskforces on Middle East Peace, Worldwide Nuclear Disarmament, Economic and Social Justice, Peace in Central America, and Jewish Feminism. Each taskforce coordinated work at the local and national level using organizing methods including national speaking tours, publications, newsletters, Internal Discussion Bulletins (NJA’s strategy for promoting dialogue about heated issues), national taskforce gatherings, and conferences. In a time before email, NJA taskforce members communicated through phone trees and hand-written letters, through mimeographed and photocopied mailings, and through face-to-face convening. Within many of the taskforces, and occasionally outside of the taskforces’ wide subject areas, NJA members often established more focused Working Groups, such as the AIDS Working Group within the Feminist Taskforce. New Jewish Agenda also used specifically Jewish cultural symbols and gatherings in their organizing, a common strategy in our current political era. For example, NJA wrote and revised Jewish holy days and prayers to reflect Feminist, Secular, and other non-traditional Jewish communities. They also used Jewish ritual in protest — for example, the Disarmament taskforce built a sukkah across the street from the White House. In 1984, New Jewish Agenda published a book with three Freedom Seders: The Rainbow Seder by Arthur Waskow focused on environmental and nuclear disarmament concerns, the Seder of the Children of Abraham by the Philadelphia NJA chapter used the Haggadah to shape a communal voice calling for peace between Israelis and Palestinians, and the Haggadah of Liberation written by the Seattle NJA Chapter/Kadima. Though NJA members identified their activism as explicitly Jewish, they were met with mixed and often critical response from the larger Jewish community. Perhaps the most extreme example of this critical response was the November 1982 excommunication of NJA members performed by three Tewksbury, MA rabbis. A more mainstream example of NJA’s marginalization is the fact that NJA was not listed in the American Jewish Committee’s American Jewish Yearbook until 1986.